Fact plus pregnancy test is a little pricier than generic brands but seems to be pretty accurate when it comes to detecting pregnancy the day of or before your missed period. I would not recommend this product for people using this pregnancy test to find out if they are pregnant more than 2 days before your expected period because of its notorious false negatives when there are lower quantities of hCG in your urine. However, if you are looking for a little less expensive pregnancy test that is name brand and it is close to your expected period date, you cannot get more accurate than the Fact plus pregnancy test. 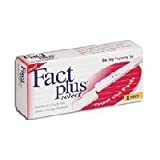 I understand the name of the game for pregnancy tests is to find the first test to accurately report a pregnancy at its earliest time, but for all of you who have enough patience to wait, Fact plus pregnancy test is a good choice for you.